Do operational requirements drive accounting policies or do accounting requirements drive operational policies? When it comes to tool tracking at most contractors the accounting policies drive the tracking process. This is due to a variety of factors but is it necessary? Is it the best way to approach tool tracking? Is tool tracking more of an operations issue or an accounting issue? This article explores how most contractors account for small tools and why this is changing at leading companies. Why asset expense policies are changing and why there is an operational benefit in viewing tool tracking as more than just cost management. Asset capitalization policies need to be re-thought when it comes to small equipment and power tools. Most asset capitalization policies were designed around large equipment and then applied to small tools. 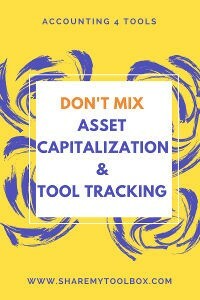 Read on to learn more about how asset capitalization impacts tool tracking and why it matters to your company. With the increasingly large amount of money being spent on tools and small equipment the dollars are significant. In aggregate tool and equipment costs are expanding faster than other job input costs. Take a look at what your company has spent on tools and equipment each year in aggregate. Break out what was “just expensed” to jobs as well as what was purchased as overhead. These tools should last longer than the job so how are they being tracked for their total life? This article is good to be shared with CFO’s, controllers and CPA’s. Feel free to forward a link to the article to spur discussions at your company.